Surveying William F. “Buffalo Bill” Cody’s life, one would be hard-pressed to list all the people that the Great Showman knew—or who knew him. From presidents to kings and from actors to financiers, Buffalo Bill was, by most accounts, the most famous celebrity in the world at the turn of the twentieth century. We can assume that John S. Bell, ex-chief of the United States Secret Service, felt the same way when he hosted Cody in his Newark, New Jersey, home. 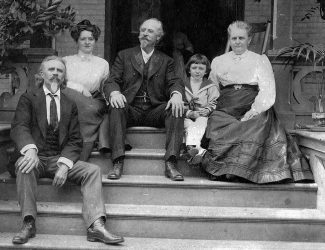 In this photograph, he and his family are pictured with Cody on the front steps of their house, May 24, 1902. The McCracken Research Library at the Buffalo Bill Center of the West offers access to thousands of historic images for research and publication, thanks in part to the Institute of Museum and Library Services (IMLS). To learn more, visit library.centerofthewest.org.